Kelly also has a new e-course that teaches women how to dress. From the basics of how science and math affect fashion, to how we can apply that to our wardrobes, the Adore Your Wardrobe course can help all women, but especially those over 40, solve that age old problem of having a closet full of clothes, but nothing to wear. I just know you are going to love today’s show. Kelly is full of energy, exciting to talk to, creative, and simply a marketing genius. Let’s get to it! Kelly began blogging in 2009 at a blog called The Kansas Mamas. At the time, she knew nothing about blogs or blogging, and she truly thought she was doing something revolutionary. She had left her corporate job to stay at home with her children when the recession hit. Her husband, as a remodeling contractor, was hit hard. Their income took a nosedive, and so she began the blog to talk about frugal living, and how her family was surviving on a lower income. As their finances began to recover, and pinching every penny was no longer necessary, Kelly began to feel a disconnect with what she was writing about. That’s when she began writing about the redefined mom; covering topics such as beauty, fashion, makeup, etc, for the mom over 40. After just a few months of keeping up both blogs, she and her husband decided to merge the two blogs into one in July of 2014. While she did feel some fear about the move, she knew it was the right thing to do. As Kelly began to redefine her niche, she knew that her Pinterest page would need a complete overhaul. She had been a late adopter of Pinterest, so she wasn’t putting much time into working on her boards. Her number of followers was fairly low, so she wasn’t too worried about her numbers dropping. It turned out that rebranding herself was a great decision for her Pinterest account. Her rebrand came just one month before Pinterest rolled out the Smart Feed, so while others saw huge drops in their numbers, Kelly’s numbers just climbed and kept climbing. Once she rebranded, Pinterest became her #1 source of traffic for her blog! Kelly then turned to her background in advertising to figure out how to grow her Pinterest page even more. She felt sure that by following a few steps consistently, she could grow her new brand through that. Her first priority was grabbing people’s attention as they scrolled, and making her images so consistent that they would stand out as her brand. She did that by using the same look over and over; the same fonts, same angle with the camera, same distance from the subject in the photo (zoomed in or out), same colors, etc. She knew from working in billboard advertising that you only have a few seconds to catch someone’s eye. A Pinterest image has to grab the eye before a person will take the time to read the Pin description. So she carefully chose images to draw attention, with text that drew people in. If someone clicks on your image and follows it to your site, they should get exactly what they are expecting. No click bait. Kelly felt like it was very important to have consistency in her brand, images, and text. She did keyword searches, phrasing searches, and made sure that the two worked well together. Because while followers and re-pins are great, the goal is to get people to your site. Once on your site, you want them to sign up for your email list. How do I get the target person I am looking for to click through to my site, to engage with my content, and to become somebody who is a loyal fan? In May of 2014, while attending Mom 2.0 conference, Kelly heard a Pinterest expert talking about a specific strategy that entailed having fewer boards, with more activity on those boards, with more engagement and audience targeting. She learned that Pinterest was looking for those that were actively curating great content onto a few great boards. The expert also said that Pinterest was rewarding people who had great profiles, with less boards; and the magic number was right around fifty. Kelly came home from that conference determined to follow the advice. Getting her boards down to fifty wasn’t an easy task. She started by leaving some group boards that she was a part of, but that didn’t fit her target audience. She cleaned up other boards that had nothing to do with her niche. Keep in mind, there were no secret boards at the time, so deleting a board meant actually deleting it! After getting her boards from 80 down to 50, she began focusing on using Pinterest the way Pinterest wanted her to. She began curating great content, having less boards to curate that great content for, and providing a great user experience. Narrowing down her boards helped Kelly to focus in much more closely on her brand, and target it to the women she wanted to reach. A mere 7 months later, she had reached 10,000+ followers. She currently has nearly 37,000! In less than a year, she has increased her followers by 30,000!! And while others have experienced falling numbers in 2016, her numbers just keep growing. How have you managed to hone in so tightly on your target reader? The first thing I do is reader surveys. This is how I find out what my readers really want. I do yearly surveys through Survey Monkey. Secondly, I ask my readers if they are interested in something I am thinking about writing about. Should a blogger without a large, engaged audience even consider doing a reader survey? Absolutely! If you plan to niche down to a very targeted audience, you should be asking anybody who comes to your site what other things they might be interested in reading about. Serving your audience increases the probability of them sticking around, signing up for your email list, and following you on social media. How do you get people to follow through on filling out a survey? The best way to get people to fill out your survey is to enter them in a giveaway if they finish filling it out completely. You can give away gift cards, ebooks, or anything that is an item that fits your niche. Once Kelly receives the survey results, the first thing she does is examine the competition. For example, her readers recently told her that they are interested in her writing more about essential oils. So she searched the topic on Pinterest to see what else people are saying about essential oils. Then, she figures out how she can do it better. One way to “do it better” is to compile an “Ultimate Guide.” Write the Ultimate Guide to whatever subject you are writing about. Include extra details, create a great graphic to go with it, and it will skyrocket. Include affiliate links to any products you mention in your guide. Any time you can use affiliate links, especially Amazon links, DO IT. If you have done your work by writing great content, your readers will want to buy the products you talk about. Don’t neglect to link to anything you can. Keep in mind — Pinterest traffic is primed and ready to make purchases; and the average sale through Pinterest clicks is $100 or more. Use amazing, consistent images for that content. It is okay to say no to group boards that aren’t consistent with your niche. If you are trying to figure out your direction, it doesn’t have to be complicated; it just needs to be targeted. Who are you trying to market to? Keep focused on that. Don’t look at what anybody else is doing. What are your tips for targeting your audience? 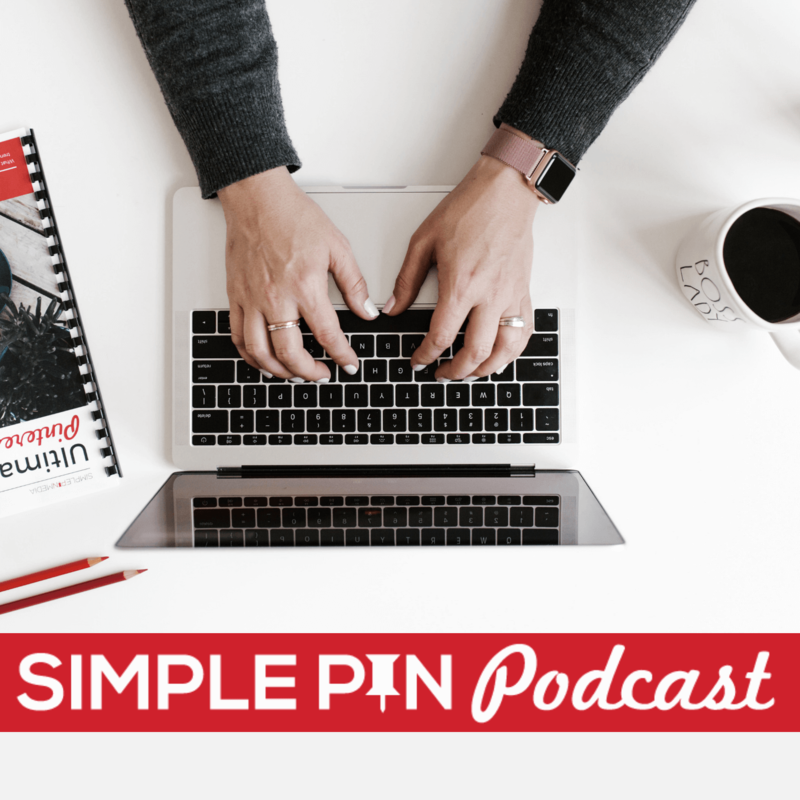 Find more Simple Pin Podcast episodes here. Can you explain a bit how this applies to surveys? Do you draw people to your survey from Pinterest? I’m one of those people with a huge quantity of *unengaged* Google traffic. I’ve done surveys the past couple Falls but don’t get a very good response. Plus, my audience is not very targeted, and I tend to get a lot of interest in me blogging about things I’m not so good at / interested in / passionate about. I’m still looking for the key to monetizing all my traffic. It’s gotta be somewhere in what my audience needs, and what I can provide. Louise – First, you should always blog about something you are passionate about and it’s fun…otherwise it is just a job (and there are a lot of other jobs out there that pay WAY more than blogging). Second, when you post about things you love, you should start to see a pattern (types of people) who are interested in what you are writing about. Third, by placing some sort of pop-up that comes up on every post asking them to take the survey for a chance to win, you are able to tap into those people who are interested in what you are writing about and get their opinion. Thanks Kelly. I’m definitely passionate about what I post – it’s just that when I ask readers what they want to hear more about, I’m not so interested in what they ask for. Thanks – I’ll definitely try the popup and contest next survey. My coach wants me to leave behind the blog for now. I don’t think I can though – not only do I love it, but I have 150K monthly readers! But absolutely – there’s more money elsewhere, my best clients are NOT coming from my blog.